Earlier today Nintendo of America announced in its Download Update that it'd be offering some tasty discounts to celebrate Super Smash Bros. for Nintendo 3DS. Details have emerged, confirming that there'll be four weeks of discounts to celebrate the various challengers from the upcoming brawler. To start off below are the confirmed discounts for week one, live right now until 11th September — we've also listed the fighters being honoured in each batch. In terms of future weeks, price details will no doubt be published every Thursday, but below are the characters represented and some of the games that will be reduced. Lots of discounts on the way, with more sure to be confirmed each week. Which of the current and future discounts will you be picking up in North America? Thanks to MrNintendoSense for the heads up. How do you give you all a 'heads up?' I posted this on the forums since I wasn't real sure where to go to show you all. @Whopper744 There's a contact button at the bottom of the site. Damn, I wish Europe had gotten the Tropical Freeze, Sonic 3D and Ghostly Adventures sales. Love this, however my only complaint is that Tomadachi Life isn't going on sale, I was holding out on it for some extra savings. Awesome. I might see about getting Super Mario 3D Land for my son since he lost it somewhere. @MoonKnight7 The lists for Week 2 onwards are only some of the titles. Given that Mii Fighters are being represented in this sale I'd expect Wii Party U and Tomodachi Life. See now US users are being treated the same by NOA or are they still useless? This is pretty weak all around. With a few exceptions like Fire Emblem and Yoshi's New Island, almost everything being offered are games they've discounted deeper before, or offered as rewards and bonuses. How about offering some discounts on stuff that hasn't been discounted or given away for free before? More discounts than in Europe - lucky guys! Wish we got the Tomodachi Life discount tho! DKC and pikmin3!....come in the same week....my wallet won't resist! @Action51 When has 3D World or Tropical Freeze been discounted ? The best two Wii U games. Superior Digital 4 Lyfe versions. Aww, no Luigi's Mansion. One of the only 3DS games I still need to get. I might get Kirby Triple Deluxe if it goes on sale. I'm thinking about getting Punch-Out, I don't really know why I haven't picked it up yet actually. Now seems like a good time to get it. I was hopping some of the NES Mega Man games would be on sale for the Wii U vc, I'll get The Legend of Zelda: The Minish Cap next week and the week after that I might get Pokémon Rumble U depending on how much it's on sale for. I was actually hoping for X2 and X3.... Oh we'll. @Swiket That game is worth it even at full price. It's a very good game. Nice. I'm finally to gonna pick up SM3DL and then Tropical Freeze when it goes on sale. I guess it's time to crack open that wallet one more time and finally get Super Mario 3D World. Let's see what responsibilities I can fluff off to find more play time. MISSPELLED LUCARIO !!!! SHAME ON YOU . Totally getting Super Mario 3D Land at that price. Awsome. Wishful thinking that Kirby Triple Deluxe will be on sale. I dropped the ball on the b1g1 free sale they had at Bestbuy and I do like my digis. Where is Metroid Prime Trilogy!? Definitely nice to see Nintendo giving some nice discounts on these games, especially the full retail titles. If Tomodachi Life gets discounted significantly, I might give it a shot. I'm still very much on the fence with that one, but a good sale might just push me over. Wrestling cosplay lucario confirmed! Luchario! Isn't offering 3D World to represent Rosalina a big ol' spoiler? These are some great deals! Will try to get both Mario NES games this week and will see about the upcoming sales. Luchario sounds like a disease. Now, Lucario however. That's a poke i can stand behind!! Yep, minish cap should do. Americans complain that Europe is getting Smash Bros. Challenger discounts; NOA announces discounts WAY better than NOE. I'm sorry but DKC:TF, Pikmin 3, FE:A AND SM3DW ALL AS EXCLUSIVES TO NOA?! That just isn't fair. Ah! The Yanks will stop moaning for a bit now! Not too shabby. I already have have the good ones, but hope everyone else enjoys! Super Mario 3D Land for $20? Excellent. I finally have an opportunity to get that game at a lower price. @Jazzer94 Yes, I seem to have a hat to eat. Now I need something new to complain about. Maybe I'm missing something, but where's the game to represent captain falcon on werk 2? nice! will buy minish cap for sure! Decided to get SMB3 for 3DS to have a portable version. Debating quadruple-dipping on Punch-Out!! to get a portable version (have the Tyson's cartridge, Wii VC, and Wii U VC). @dizzy_boy Weeks 2, 3 and 4 don't have all discounted games announced. Well if the DKTF discount is good I may get that digitally instead of retail. Week 2 could be a spendy week. I'm prepared. Hoping the DKCTF discount is as good as the SM3DW one is!! It's awesome too see the deals. But scrolling down all I could think was I have way too many video games. Already have every game on that list that I want and bought this week...the fall, steamworld dig, thorium wars, whole 2nd season of walking dead, and Kirby fighters. I haven't touched my ps3 in weeks. Nothing but pc and Nintendo bleeding my time and money away. And add cubeman 2 too that list. Holy moly mole. That's a lot going on sale there! LOL so true. In the other article, they didn't mention 3D World because they might spoil it. Anyway, I want 3D world and DKTF discounts on Europe so I can already sell my retail discs. @BensonUii I followed Nintendo's lead there! @ChemyNoSurfea Hoping you're right about Mega Man. I don't think it'll be all though. Mega Man on VC alone could be more sales than all of the sales this week. Why does the last week have Fox, when there is no Star Fox 64 3D on the list? So much sales, ehhh I'm currently saving for either Hyrule Warriors or Alpha Sapphire. But those sales, makes me want to just throw away my money into eshop cards so I can buy some games. Decisions decisions. YES! I would have been so pissed if NA didn't get these discounts like Europe. "In terms of future weeks, price details will no doubt be published every Thursday, but below are the characters represented and some of the games that will be reduced." I hope there will be more games. They really should throw in Star Fox 64 3D, because that one is NOT worth $40, no matter how much I love it and want to replay it. Maybe Megaman X and Mario bros 3 for me. I already have most of these games, and I don't feel like spending too much money right now. Excellent list. I hope North America gets the Hyrule Warriors sale too. I'd liked to complete my Zelda VC eShop collection. Starting tomorrow eShop cards are 10% off at Target (additional 5% for Redcard members). Ungh now I have to look through my budget and figure if I am going to purchase Fire Emblem Awakening, Super Mario 3D land, or DKC TF. Any Advice? @Undead_terror Haha...I used to hear that a lot when my brother played zombies. @NextChannelGame I was wondering the same thing. Also, why does week 2 mention Captain Falcon, Pit, and Palutena if there are no games related to those franchises? Also seems strange that 3D World is not under Mario, Peach, Luigi, and Bowser, but under Rosalina. Seems like she could just be grouped in with the other characters. Not that it makes a big difference. I already own most of these, but I might as well get Super Mario Bros. 3 for 3DS. I already have it for Wii U, but it would be nice to play it on the go. Might get Sonic the Hedgehog and Metroid too. Is Ghostly Adventures any good? I was thinking of that one too but not if it's not any good. @Giygas_95 Same here! Maybe Nintendo well announce more discount games? Like F-Zero, Kid Icarus Uprising, Kid Icarus. @TICGS I'd say go for Awakening. It never goes on sale physically or digitally (I can only think of one time it has happened, maybe I'm forgetting another time). Feels like the best chance for people unwilling to pay the full 40. @TICGS Super Mario 3D Land is amazing fun, but quite easy. DKC TF is a fantastic game. One of the best on Wii U. FE:A has an enormous amount of content for your money. It really comes down to what you want though. Do you know if you'd rather have a new 3DS game or a new Wii U game? If you want a new 3DS game, would you rather have a fun pick up and play 3D platformer or do you want a really in depth strategy RPG experience? I'd sort of have to agree with this guy ^. That game has a whole lotta bang for your buck. As a second choice, I'd say DKC TF. As a side note, FE:A is the one 3DS game I have that I kind of wish I'd gotten the physical version of instead of the digital version. Love that box art. It's on the Wii, where you can't download it, but can find it at a decent price online or from Gamestop. @ThomasBW84 - No difference in Canada on the Mario ones. I was thinking about trading in all of my physical 3DS games and downloading all of them when they go on sale. Anyone think this is a good idea or should I just keep my physical copies? I love physical copies of games (I am a collector), however, the portable convenience would be very nice, especially since I go out a lot. Any suggestions would be greatly appreciated! No Kid Ikarus, no Fire Emblem Sacred Stones, no Zelda WW HD and ALBW. Come on, NoA. Double standards have been terrible on the eshop. Ah yes, I see what you mean. I didn't fully read the line above the other weeks. Thanks for the clarification. I got Punch-Out this morning for the 3DS this morning. As for the rest of the sale, I don't see too much I don't already own or want, but good on Nintendo for throwing North America a bone. Fire Emblem Awakening for me next week, and maybe Mario 3D Land this week. 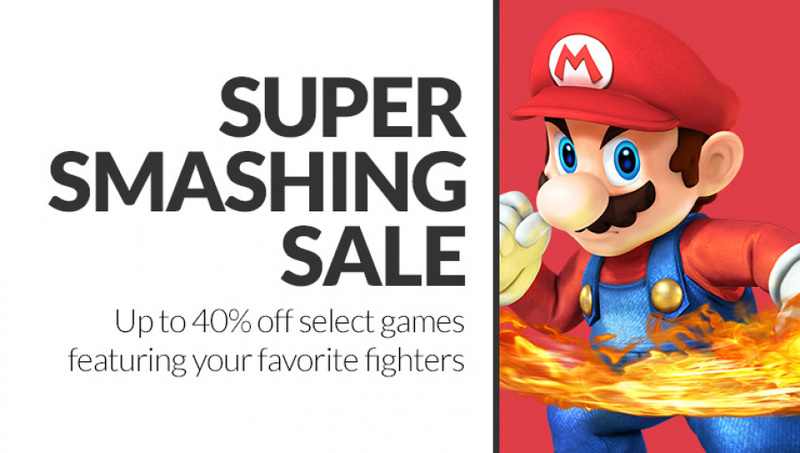 I remember people here saying NA wouldn't be getting the Smash Bros discounts. I'll definitely be getting Minish Cap and Pokemon Battle Trozei. Wii Fit U for me, depending on the price. If it's $20 or less I'll probably go for it. Oh hey, Tropical Freeze! Glad I held out on that. Great, now I can play Fire Emblem: Awakening. Lame sale. Most of the games for the 3DS that are being featured I already own. The ones I don't own I either don't want, or the bargain isn't big enough (for me). Some gamers may think this isn't a great sale, but when are you going to get Nintendo's first party titles for 20-30$ off, outside of a greatest hits collection? Good time to pick up Super Mario 3D World, for all those who haven't yet. I like the spectrum of games. Here's hoping for Sonic: the Lost World (personally) and Wind Waker HD (for those who haven't picked it up yet). Rosalina, for reference, was the only unlockable character in SM3DW, a game which marked her first appearance since Galaxy and her last appearance before MK8 released this past May. @lilpieri I've been thinking along similar lines. Ever since New Leaf came out, I regret not getting it digitally. Same for Fire Emblem. I'm not sure if I'll pull the trigger on replacing them, even with a sale, but I am more than primed to go digital on many 3DS games in the future. Here's something INSANE: you know how Amazon has Amiibo up for preorder? Well, I'm not sure what it's like in other countries, but the top 12 on Amazon.ca's Best Sellers list are all 12 Amiibo figures. Honestly, it could be what turns the Wii U around and shoots the 3DS / 2DS into the stratusphere. Hooray! A big sale on games most of us already own! Man you get 3D World and Tropical Freeze.... and what did we get? Uninteresting games and games I already bought for full price. No that's not true. We got Fire Emblem for 2,50 less, what a bargain!! Wait, NoA is having a real sale on games people want? That never happens. Cool. Too bad I already own almost all of these games. I just had to grab 3D World and am now waiting on the Tropical Freeze pricing. I'd almost be tempted by 3D World, except that I can find a new copy for about forty bucks, anyway. Of course I bought Mega Man X just before these sales. I wonder why Super Metroid isn't going on sale for this. Only the original Metroid? I have like, four copies of the game, already. I don't need to get it on Wii U, too, but I do think I'd buy Super Metroid again to have it on da Wuu. @Jazzer94 Well Europe is getting the Smash 3DS XL as a bundle sooooooo. @ZachBeacon The Mario Kart 8 sale and the Fire emblem/Shin Migami Tensei sales? Aw no Kirby Triple Deluxe? I'm hoping Tropical Freeze will go on sale come week 4. That's really good news. The problem is that I already bought everything on launch days. I'll tell my friends about it tough. What?! No Ocarina of Time 3D? Man, I was hoping there would be some kind of discount to commemorate our favorite Moblin slayer. Have most of the other games. Been waiting for Super Mario 3D Land to go on sale. So I will be grabbing that. So anybody else notice the sale advertising on the Wii U Gamepad? I love the quick start menu and use it all the time, but I see now why Nintendo gave it to us, the perfect place for advertising. It's impossible to ignore that blue circle glowing and those screens across the top. Guess it's a win - win. On the bright side, it was nice to see something besides the MK8 DLC, I was afraid I would be looking at that ad for 8 months. @eleccross Pretty sure Shin Migami Tensei is the only game you mentioned that has ever been on sale on the eShop. @ZachBeacon No I mean when you bought Mario Kart 8 you got a game with it free and if you owned shin megami tensei and fire emblem awakening you got $30 or $40 free. Those were two sales in NA that Nintendo did that were pretty amazing. And those are only two of them. Animal Crossing: New Leaf is probably the only one out of these listed I will get. I'd rather have Triple Deluxe or Tomodachi Life though so if the lists aren't complete then hopefully those get added to Week 3 or 4 (since my lack of funds for the time being will cause me to miss the first two week sales). Granted that Sonic on the 3DS is the 3D one I'll probably get that. Nothing else though, retail deals just aren't good enough. I can still get physical cheaper. @ThomasBW84 - You got Luchario is that suppose to be Lucario?